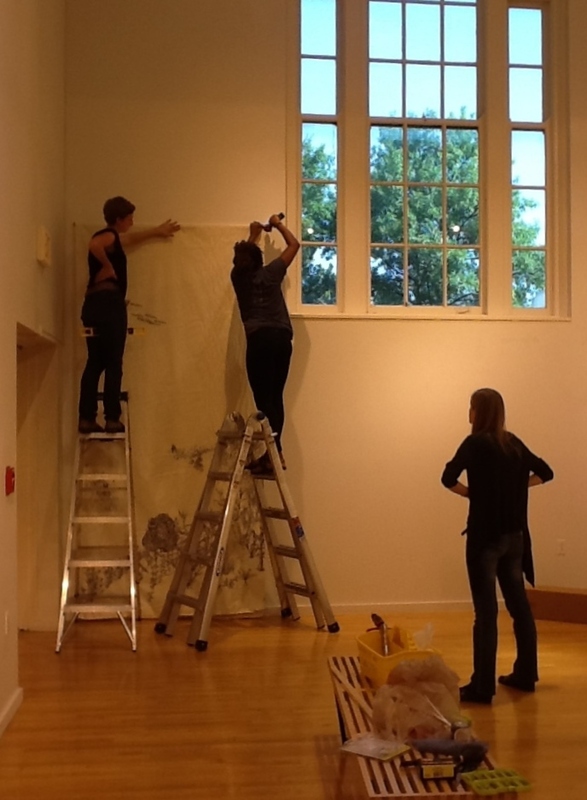 Art professors Lindsey Dunnagan and Francine Fox promoted interdisciplinary studies by inviting their students to sketch or paint in partnership with the sciences for first-hand experience with live, unique subjects. Dunnagan’s class worked with science professors, including Jay Bauman, Elisabeth Hooper and Timothy Waston. Bauman taught students how to attach reflective nodes to their bodies and capture motion in 360 degrees by using special recording devices in the Piper Lab. Students painted how meaning is conveyed in body movements using the technology. 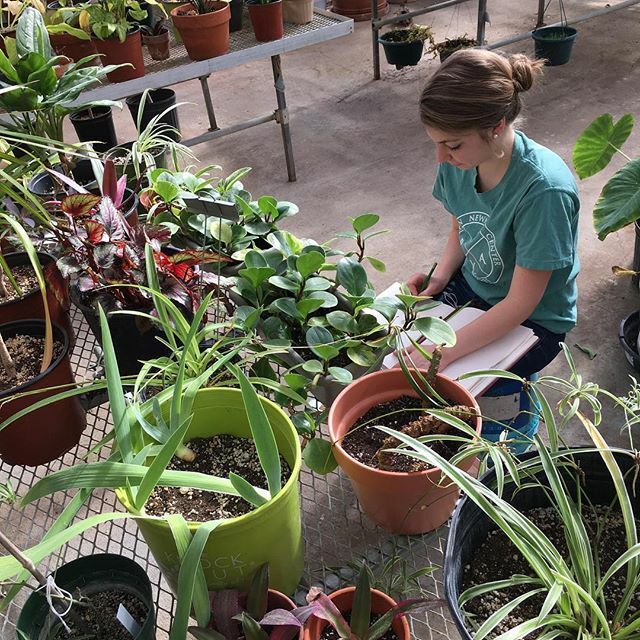 In another project, students painted plants and animals from the greenhouse using elements of a Japanese marbling technique and seed collections. Walston also set up a lab for students to investigate single cell organisms from pond water. The students also explored how other objects, such as dried plants, a cracked egg and clothes, looked when magnified a thousand times. New Assistant Professor of Painting, Lindsey Dunnagan, is giving this week’s “#15 for Art” talk. Come to the University Gallery on Thursday October 20th at 4:45 pm. These images may give you a sense of her work, but come and see what she talks about on Thursday afternoon. For the past year, I collected locations from people in North Texas and beyond, including various student groups and a refugee center in Dallas. Now their names and “ideas of home” have been painted onto a large-scale installation that forms a labyrinth. As visitors walk through the painted translucent walls, they may find a location that holds significance to them while also experiencing other places that are cherished. In this way, the project presents the world as a treasure and a place to discover; it intimates a deep connection we have with each other and the planet. 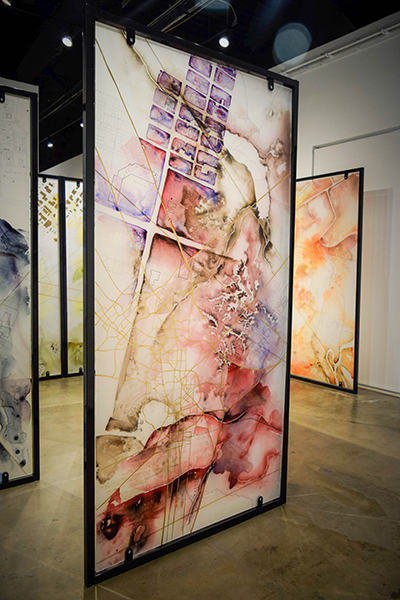 Lindsey Dunnagan, The Journey Home Project, on display in Dallas, August 2016. 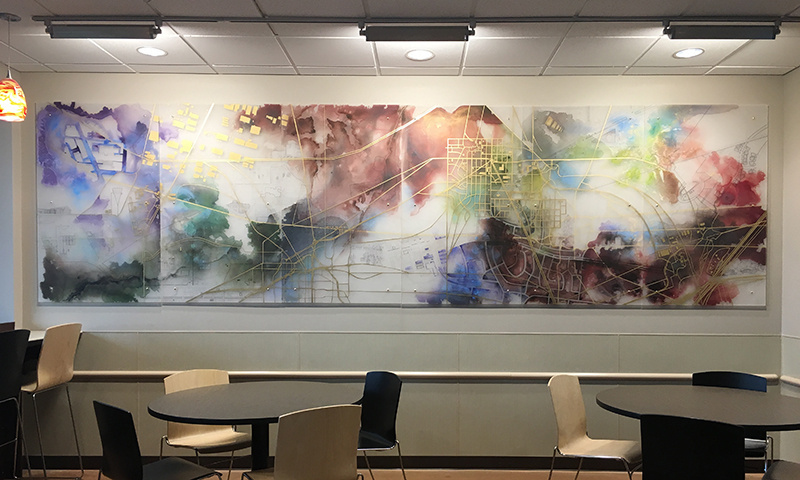 In addition, Lindsey Dunnagan installed a large commissioned work in Fort Worth, TX, at Store #532 of the Kroger Company. Native Treasures is painted and drawn with watercolor, ink, salt, and acrylic on Clear Acrylic. You can see it in Fort Worth at 5241 N Tarrant Parkway. Native Treasures, 2016, installed in Kroger store #532. All photographs courtesy of Lindsey Dunnagan. and Darrell Williams, who will be going to the University of Missouri to study for his MFA in Painting. One of the pieces from Darrell Williams’ BFA exhibition, 2015. Stay tuned for updates on what other students will be doing with their summers, and if you are a current or former alum who has news, please email us at art@truman.edu. One of Ricardo Quiñónez Alemán’s paintings on display in the University Gallery. The University Gallery is welcoming Truman State University’s new painting professor, Ricardo Quiñónez Alemán, by hosting his exhibition Within My Borders. Before coming to Truman, Quiñónez spent two years conducting observational research at the southern U.S. border dividing El Paso, Texas, from Ciudad Juárez, Mexico. Quiñónez is from Ciudad Juárez, and wanted to go back to his roots after spending many years living and teaching in the Midwest. He spent this time at the border researching the conflicts people face at the line dividing the two nations. 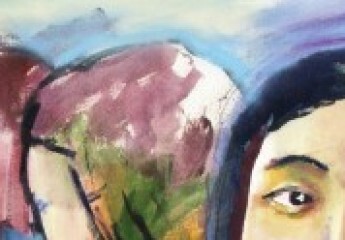 Quiñónez uses painting as his mode of storytelling. He said he uses a process of underpainting and glazing from the 16th and 17th centuries. He calls his work a constant experimentation and makes modifications by applying new techniques in background lighting, layering, paint thickness, and sizing. Quiñónez loves working with a paintbrush has been inspired by many artists over the years. Within My Borders will be on display in the main gallery from January 21 to February 26. An opening reception with refreshments will be held in the University Gallery on Tuesday, January 26, at 6:00 p.m. The gallery is free and open to the public. The last week of classes is always busy, but it is good to get out and enjoy looking at some art. Fortunately, there are lots of opportunities this time of year. One of the pieces from Darrell Williams’ BFA exhibition, up in the gallery from November 30th to December 4th. Darrell Williams’ B.F.A. 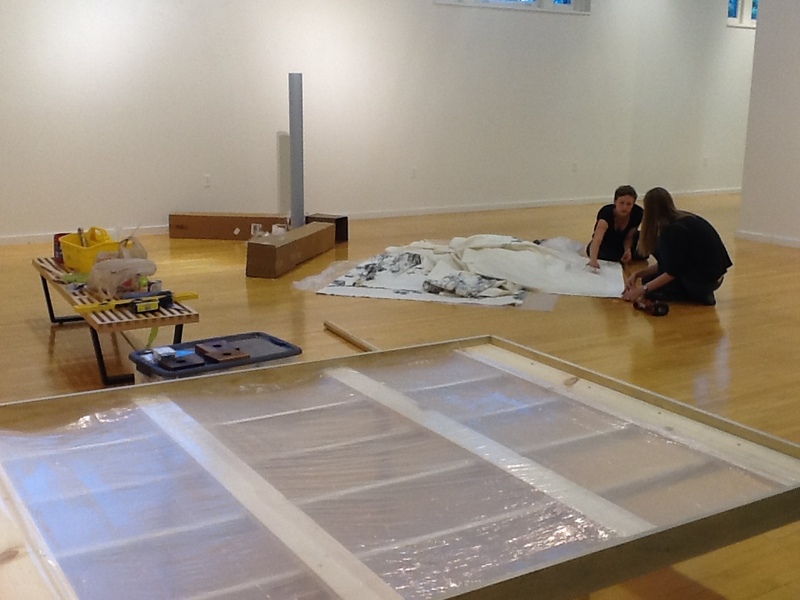 thesis show will take place in the gallery November 30 to December 4. 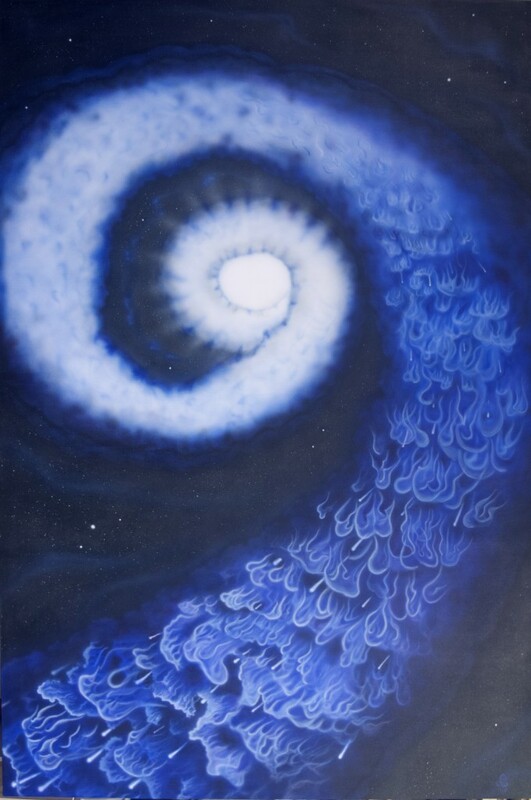 His show includes six large (4 x 6 foot) works painted in acrylic using airbrush. Each presents an interpretation of a specific verse of the Bible dealing with the subject of spiritual warfare. 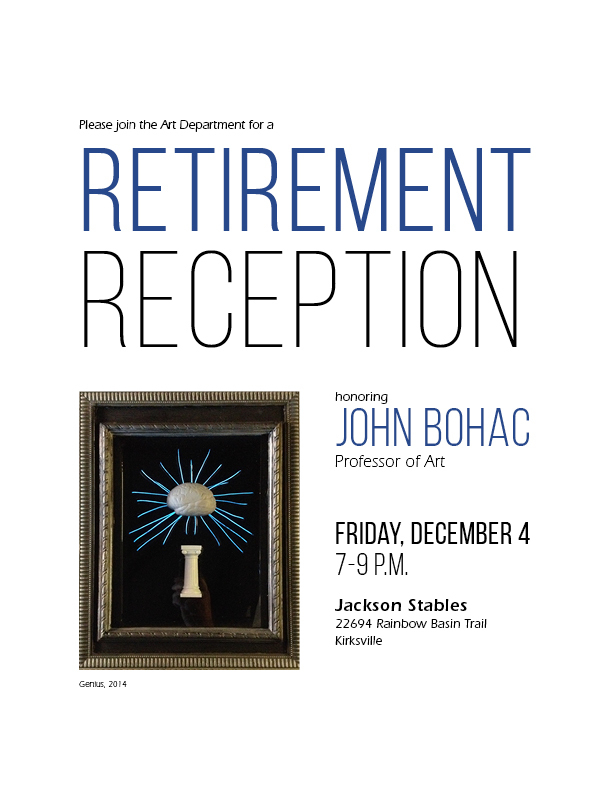 Please join us for a reception Tuesday evening December 1 at 6:00 pm. Accompanying this BFA show, the “Strong Foundation” show in the side gallery will present faculty selections from this fall’s art student proficiency examinations. Elsewhere on campus. students from the Visual Communications 4 class are exhibiting in the SUB Activities Room from Wednesday night, December 2nd, to Thursday night, December 3rd. The exhibit also will have a reception, on Thursday, December 3rd, at 7pm. The Visual Communications 4 class has been looking how Truman State University has been branded and deciding how they as students think it could be enhanced. Each student was given a department at random to design for as well. The results of their work will be on display at the SUB this week. All these exhibits will highlight student work and give you a chance to talk with the artists. Please come out and enjoy the art on campus.